First things first- the mother of all accessories. I think I am going to explore this further in a separate how-to post. I have a book, Making Vintage Bags by Emma Brennan, that I will probably use as a starting point. I’ll try to gether my materials in the next week or two and see what I can put together. Next up, Ellen’s black coat with a big, floppy bow. Since Ellen removes her polka dot dress, her overcoat acts as her dress. 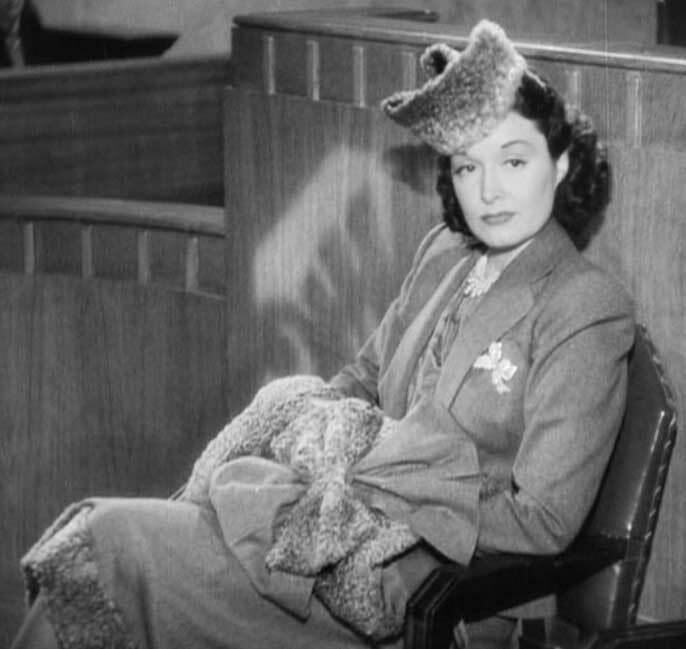 The coat is interesting- the collar has to have a low enough profile or small enough points to essentially disappear beneath that bow. 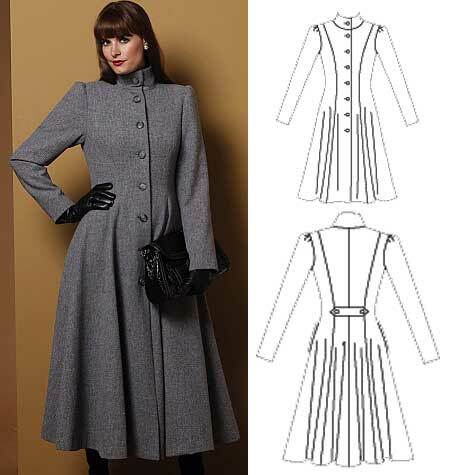 I’m really liking Butterick 5425– you could make it in black vinyl and look like Trinity from the Matrix, or use a medium weight dark grey wool blend and look like a modernized Ellen. The fit is beautiful, the shoulders are perfect, and think of all the fun little details you could substitute in for that tab in the back. Buckles, bows, rhinestones… oh the possibilities. If the standing collar is too high for you, cut the height in half or leave it off entirely. The decorative bow is actually incredibly easy to manage, as illustrated here. KA-POW– It took me a few days, but I have thought up a few ideas for this dress. The important elements are that the front and back must be divided by a seamline, preferably centered, to allow for construction using contrasting fabrics. That being said, the first pattern I gravitated to was Burda 8438. There is a center back seam, but the dress itself is Asian inspired, so the front seam is off towards the left shoulder. I like this because the area you would need to create the explosive appliqué in is smaller, and hopefully more approachable. This dress is much more closely fitted than the one Ellen wears, but I like the Asian influence- that is really very period-appropriate. 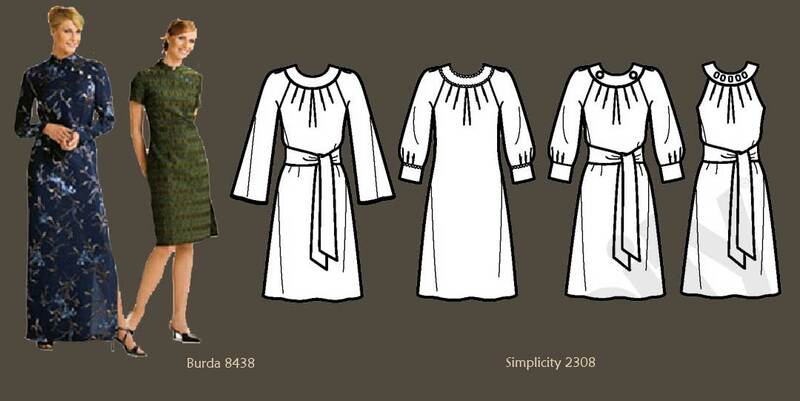 For a more true alternative, try Simplicity 2308. The pattern doesn’t provide a center front seam, but it should be easy enough to split the front in half to create the seam you need. The high neckline works, as does the overall looser fit, the various sleeve options, and the waist sash. The other alternatives I can think of would be to start with a shirt-dress and use the front button (or zipper) placket as the anchor for your appliqué. Or you can rotate the concept and have the appliqué go on top of and below the waistline or bustline (depending on your pattern). I don’t love this alternative because it has the potential for disaster in adding volume (and explosives) to an area you might not be fond of emphasizing. You could also do this just as a blouse, rather than a full-length dress, and you would fit right into 3.1 Phillip Lim’s Pre-Fall 2012 collection. In all cases, you would need to fashion two or three appliqués that are mirror images of one another- you could use contrasting colors, as Ellen does, or a more subtle approach would be using different textures- as in the shiny and dull side of satin. I googled “explosion clip art” and quickly found some viable options for appliqué templates. So there- now you have a bunch of different options now for hi-jacking this look. Next up- the nightwear. For this, nothing beats a true vintage pattern. I recommend scouring all the vintage pattern collection and sale sites you can google until you come up with something good. Your search terms on the sites should include lingerie, nightgown, slip, robe, dressing gown, etc. 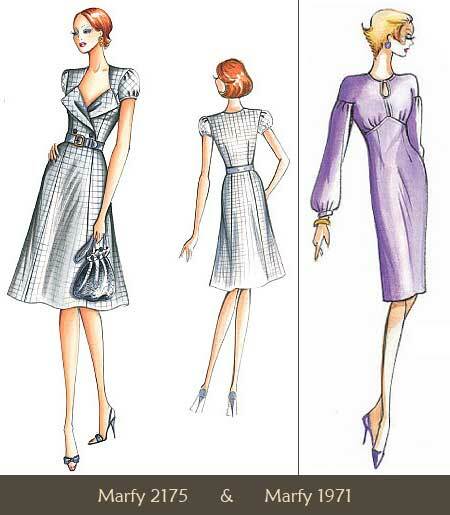 If you start with the Vintage Pattern Wiki, you can find the pattern for something you like, then search eBay and other sites for that particular pattern for sale in your size (for vintage pattern shopping, you need to go by your bust and waist measurements). Also take a look at mid-century evening gowns; if done in tricot or a thin, silky jersey, you may be able to put together a perfectly beautiful nightgown with special details. You’ll want to use the best fabric you can afford- silk if possible. 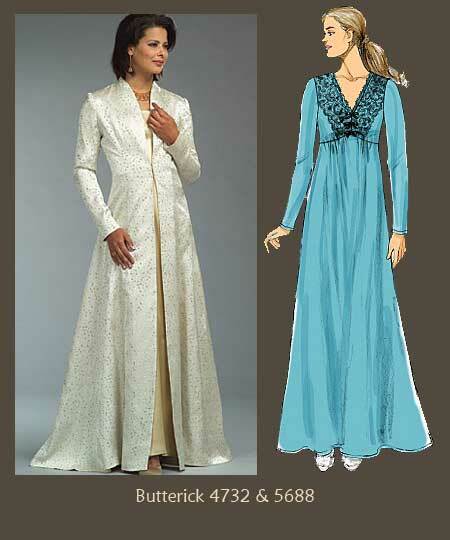 Make sure you like the way it moves and drapes, and especially how it feels against your skin.Just to get you started, look at Butterick 4732– the jacket would be an ideal robe once trimmed with lace or feathers; Butterick 5688 is a good enough start for a gown- it’s prettier than a Snuggie anyway. Bianca’s sweetheart neckline LBD is interesting because it is such a classic vintage form- I think 80% of all prom dresses between 1945 and 1960 were iterations of this dress. 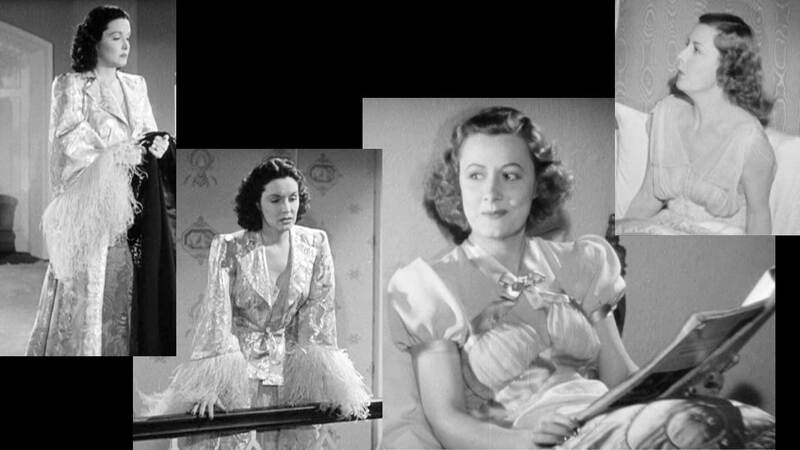 Bianca’s is set apart because of the chiffon blouse overlay. You can find countless authentic patterns for the base dress, and then simply make a large collar-less blouse in chiffon, and attach where the bodice meets the skirt. Check out New Look 6048 for an approachable dress pattern- and it even has the extra trim around the decollétage! If you want to modernize the look McCall’s 6460 is a great option: still sweetheart, but a more streamlined fit and an integrated sheer portion above the bustline. 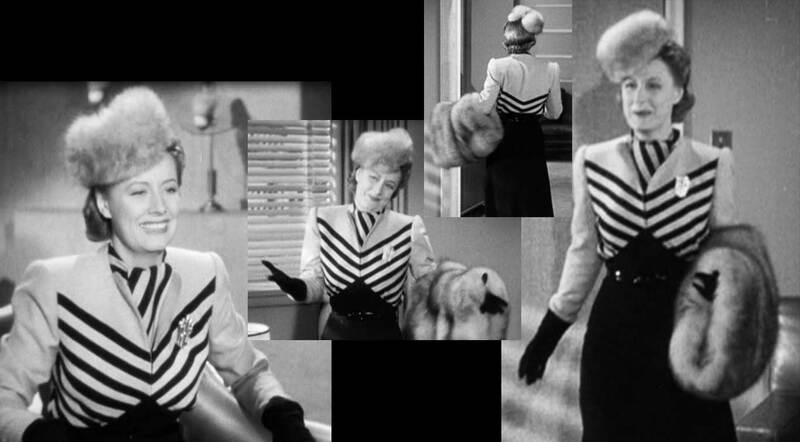 Ellen’s incredible stripes outfit is surprisingly difficult to replicate. The important elements are the stand-up collar, exposed neckline for the scarf, center seam, and inverted V-shaped waistline tailored and belted at the true waist. Marfy offers two options that capture the spirit of the ensemble, if not an exact replica. The first, 2175, I like for the collar points which you could make using a striped fabric- think how skinny you would look! I also like the fit at the waistline. A looser interpretation is 1971. This one has the inverted V waistline and a much more relaxed fit, but the keyhole at the neckline is a sweet little detail. You could also think about layering a cropped jacket over a dark dress or high waist skirt, and this would mimic the proportions of the original outfit fairly well. Finally, matching plaids: If you don’t have The Complete Book of Sewing Shortcuts by Claire Shaeffer, you should. She dedicates a few pages to working with plaids and stripes. Lindsay, Fun post! I am trying the biggest bow ever for a 50’s party I am attending tonight. I have used a fun red/orange upholstery remnant that might be small, but if it works, i will try to send you a picture. Your ideas for simplifying vintage techniques makes it easy for everyone! Thank you! I love that you were inspired to try something from here and rock it in the real world. Send me a pic and I’ll load it to the Fitting Room Gallery!